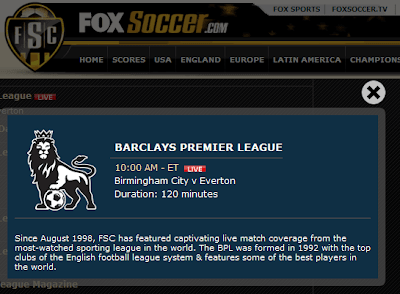 Eye On Sports Media: FOX Soccer Channel Airs Game as "Live" That ESPN SoccerNet Shows as Final? FOX Soccer Channel Airs Game as "Live" That ESPN SoccerNet Shows as Final? Riddle me this good readers: how can a soccer game being aired on the FOX Soccer Channel as live (the "Live" bug was displaying on the screen) also be reported as completed on the ESPN SoccerNet LiveScore page? That is a question a reader asked this morning. "I am watching the Everton - Birmingham English Premier League game on the FOX Soccer Channnel and it says "Live" on the screen. 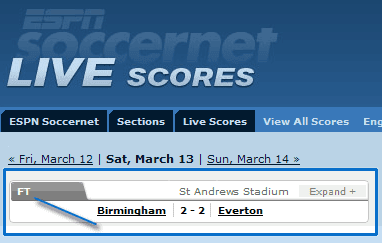 But according to ESPN Soccernet/Livescores, the game is over and it finished in a 2-2 tie. I checked to make sure it was not my TIVO, and it was not. Is someone at one of the networks wrong here?" It is hard to say if the someone is wrong, but something is very strange. Here are screen shots from the two sites. 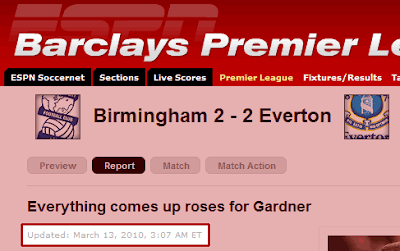 But even stranger, the ESPN Barclay's Premier League web site shows the game story as last being updated at 3:07 AM ET TODAY. So good readers, there is no easy answer to this question, so I will pass it along to people at the netwworks to see what is up with this confusion.